Office Building for Sale - 410 North Lemon Ave - Ontario, CA - News - Resources - Allied Commercial Real Estate, Inc.
Allied Commercial is proud to offer a 4,614 Sq. 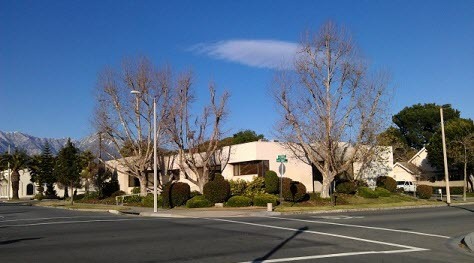 Ft. Office Building for sale in Ontario, CA. Features a rare drive-thru lane for drive-up access to an ATM - presently utilized as a credit union branch. This office building features an abundant amount of parking is available within the parking lot with 29 parking spaces for a parking ratio of 6.3 spaces per 1,000 square feet, much more than a typical office building parking ratio, which is 4 spaces per 1,000 square feet. With the extra parking medical uses may be possible, including: health clinic: pharmacy: dentist; orthodontist; physical therapy; counseling; or psychiatrist uses. Single-story office building that is well integrated into the neighboring community; the grounds are professionally landscaped with neatly trimmed shrubbery and trees presenting a pleasant, professional business appropriate appearance from the street. Currently occupied - do not disturb. Shown by appointment. Located at the northeast corner of the intersection of North Lemon Avenue and East D Street. The immediate neighborhood is Downtown Ontario. To the south is the City of Ontario complex, which includes multiple municipal buildings, including City Hall and Library. To the west, significant commercial office and retail development properties are located nearby, with the majority along the Euclid Avenue corridor, one block away. Many residential properties exist to the east and north. About 2½ miles south to 60 freeway and about 1½ miles north to 10 freeway. Currently occupied - do not disturb. Shown by appointment.